Twenty years later, this film still understands Batman like no other movie has. Batman is my favorite superhero, which is strange when you consider that I grew up on Marvel comics, not DC. Marvel was always way more identifiable to me and those characters all had real problems like paying the rent, or missing a date because the city was being attacked by Doc Ock. Yet as much as I loved those Marvel heroes, Batman has always had the strongest hold on me. Looking back on my childhood, I can see that Tim Burton’s 1989 film Batman had an insanely big impact on me. It was that movie, along with its sequel Batman Returns in 1992, that solidified Batman as more than a member of the Justice League, more than a Super Friend, and certainly more than the spandex-clad Adam West that I’d identified him as up until that point. With Tim Burton’s films, Batman became an obsession for me. Our Fox affiliate ran commercials for the local comic book store that informed viewers to come into the shop and tell them they saw the commercial on Fox for a free Batman comic. I ended up doing this about once a week. I wasn’t alone, as there was an entire generation of kids who felt exactly the same way. Bat-mania had swept the world. The Bat-logo was on everything, and how much Bat-paraphernalia someone owned suddenly became a mark of how cool a kid was. 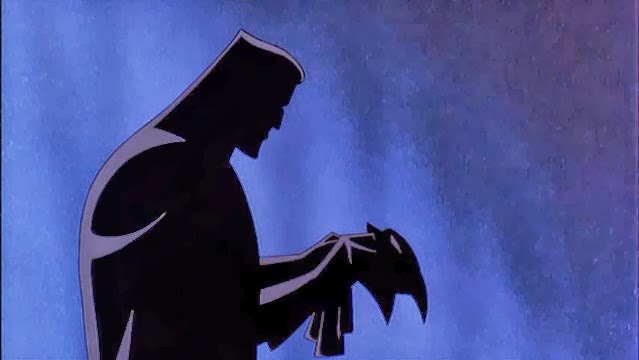 A new animated series was inspired by this darker, purer vision of Batman and debuted just three months after Batman Returns opened in theaters. Batman: The Animated Series made a prime time premiere on a Sunday night in 1992, and I watched it with my whole family. They liked it because it was smartly written. I liked it because it wasn’t like anything I’d ever seen before, with backgrounds drawn on black paper stock and with plots that harkened back to the classic days of Warner Brothers and film noir. I was hooked, and this animated series became my new favorite thing in the world. Each day I would rush home from school to see what new criminal Batman would face. The show never let me down and often presented sympathetic, deeply flawed characters that were written with depth and realistic motivations. I didn’t know it, but this cartoon was teaching me how to be a film fan. The series was a success, both with viewers and with critics, winning multiple Emmys and drawing large viewing numbers among college students. 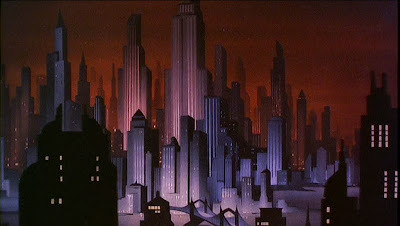 Warner Brothers decided to cash in on the success of the show by producing a direct-to-video film, which was to be released using the same crew, voice cast, and creative team behind the daily adventures of Batman: The Animated Series. Early in the process, though, Warner decided that the movie would be even more viable and lucrative as a theatrical film. The production schedule was a mere eight months. 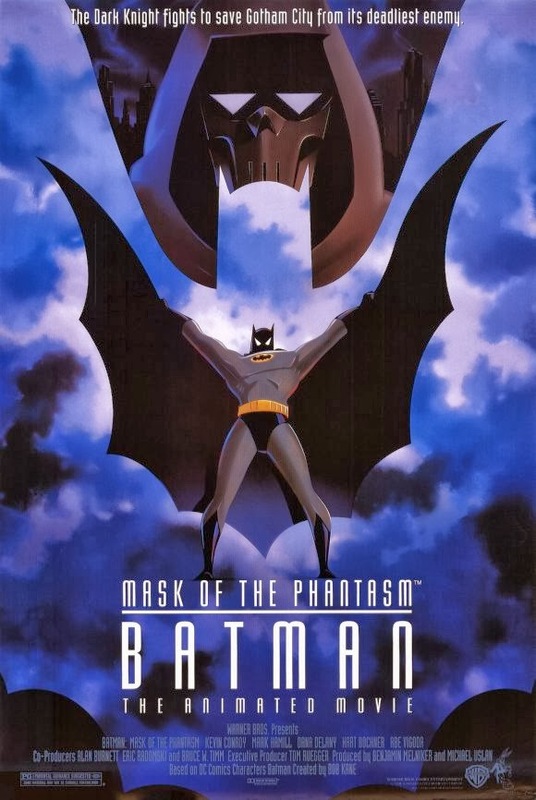 Batman: Mask of the Phantasm was released on Christmas Day in 1993 and, despite being critically lauded, was a box office bomb. I saw it with my parents in an empty theater. Amazingly, they fell asleep, oblivious to the movie magic that was unfolding before them. The film opens with the familiar, moody theme from the animated series. Only this time, a full chorus of voices has been added, chanting in Latin over the dark, musical landscape. 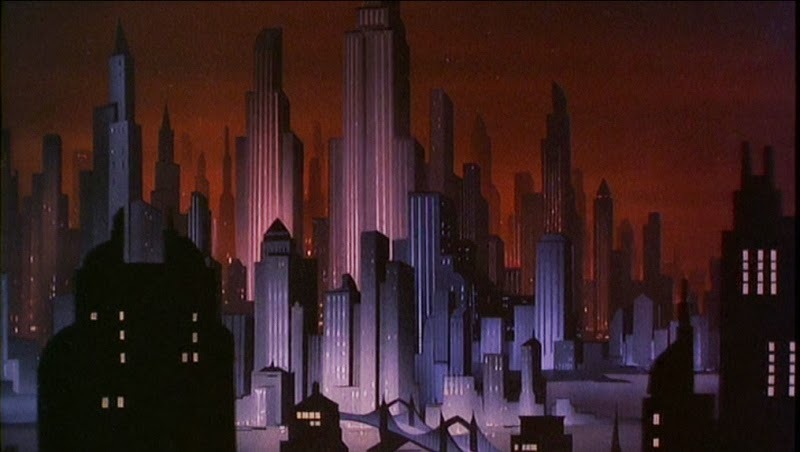 Complementing the music, the camera soars through the Gotham City skyline, showcasing the art deco architecture and old school animation tactics employed by the Fleischer Studios on their landmark Superman film shorts during the 1940s. This establishes Gotham as a living character in this film -- perhaps our main character. It’s a city full of darkness, but still beautiful and worthy of a savior. 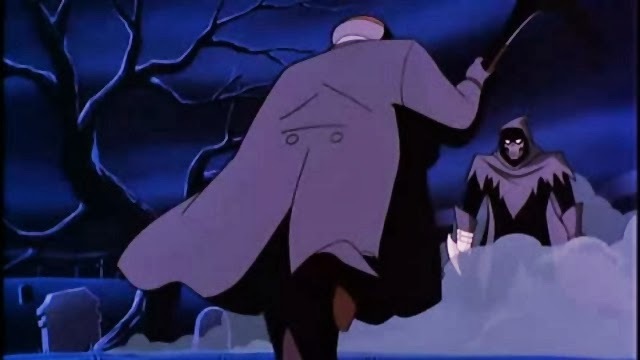 The plot of Batman: Mask of the Phantasm feels like it belongs in a film noir from fifty years prior. We have corrupt city officials who have financed mobsters for their own political gain. The mafia itself is made up of aging gangsters with gray hair and liver spots, now too old to be truly effective. Someone in Gotham has started to kill these mobsters one by one, as if they were being punished for a secret crime they committed long ago. The evidence points to the city’s protector, but darker secrets wait to be uncovered for those willing to look. This is not the stuff of children’s entertainment. Watching the movie in preparation for writing this, I kept wondering “What were they thinking? !” I don’t mean that in a negative way; I truly wonder what the creative team was thinking. The film is beautifully written, and the story is full of nuance, humor, poignancy, and even tragedy. But writers Alan Burnett, Paul Dini, Martin Pasko, and Michael Reaves were given the task of writing a feature length, animated family film to be released on Christmas Day. What they delivered was a tale of political corruption, the on-screen murder of no less than three characters, and a tragic romance with a femme fatale. As amazing as the script is, this surely was not what Warner Brothers had in mind. That’s not the only mind-boggling aspect to this film. The action and the violence that is displayed on screen not only wouldn’t fly in children’s entertainment today, but seems shocking even for 1993. Characters smoke (both cigars and cigarettes), bleed, lose teeth in fistfights, and ultimately die, all on screen before an audience of children. As much as the parent in me wants to object to this content, I remember sitting in that theater twenty years ago and LOVING IT. I felt like I was getting away with something. And I probably was. I referenced Batman: Mask of the Phantasm earlier as a masterpiece, and it definitely is. It feels like the writers and the directors (Bruce Timm and Eric Radomski, the two co-creators of the animated series) were aiming well beyond the limits of traditional family fare and at something that would be timeless. They succeeded in both. The film is full of symbolism and metaphor. As this new vigilante in Gotham City starts killing criminals, Batman (voiced, as in the series, by Kevin Conroy) must discover the identity of the Phantasm and bring him to justice. The movie asks some difficult questions. What makes the Phantasm any more of a criminal than Batman? Batman doesn’t kill and lives by a code, but Phantasm lives by a code as well. What is it that makes Batman’s code more acceptable? Batman: Mask of the Phantasm portrays Batman as a man driven by his own form of madness. For all the good he does for the city, he walks the thin line of sanity. Batman’s investigation into the Phantasm murders is complicated by the arrival of Andrea Beaumont (Dana Delany), an old flame from Bruce Wayne’s past. A significant portion of the film takes place in flashback, as we see a young Bruce struggle with his new obsession with fighting crime as Batman while trying to maintain a romantic relationship with Andrea. We know things didn’t work out, but the film slowly unveils why. It’s heartbreaking, and fits perfectly within Batman’s neuroses. Bruce Wayne is haunted by the death of his parents and can never allow himself to deviate from the path he feels fate has chosen for him, not even for his own happiness. That neurosis won’t allow him to have peace. Arriving late in the film is the Joker, voiced by Mark Hamill. 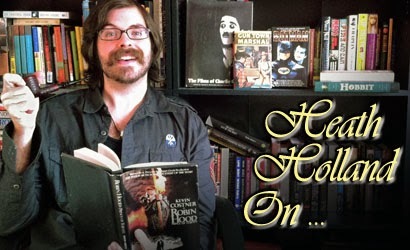 His Joker is, in my opinion, the greatest portrayal ever of the Clown Prince of Crime. That certainly is not intended as a slight to Caesar Romero, Jack Nicholson, or Heath Ledger. But Hamill’s Joker exists as a force of anarchy and chaos fifteen years before Ledger’s performance. He has no real motivation. He doesn’t want anything. He isn’t on anyone’s side; he is simply insane. His only goal is to amuse himself, and what amuses him is murder and destruction, but never without a purpose and never without a punch line. As crazy as the Joker is, he does have a code. Murder can’t be too easy. It has to have a certain style to it, and it has to be fun. 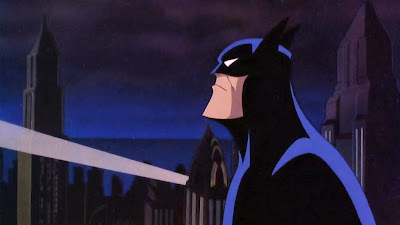 I don’t think any film version of Batman has gotten the motivations and psyches of Batman and the inhabitants of Gotham as right as Batman: Mask of the Phantasm. Tim Burton didn’t, and Joel Schumacher wasn’t even interested. Christopher Nolan seemed to be on the right path, but threw it all away in The Dark Knight Rises with the odd things he had his characters do which went directly counter to what had come before. This film has clear motivations for every single character in it. Those motivations aren’t pointless. They’re completely believable and understandable. And the film understands the duality of Batman and the Joker as two sides of the same coin of madness. They represent light and dark as two natural forces, which can’t exist without the presence of the other. The themes of decay are present in the movie as well. We see a flashback of Bruce Wayne and Andrea Beaumont going to Gotham’s World’s Fair. It’s a mirror of the Chicago World’s Fair of 1933. The future is bright and optimistic; technology is friendly and will enhance the lives of the citizens of Gotham. A brighter world is just around the corner. 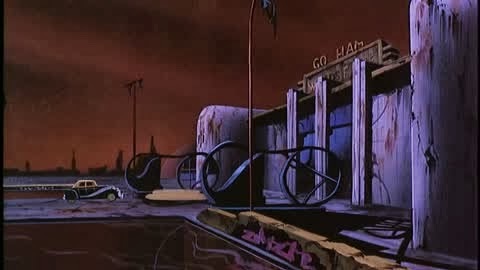 Later in the movie, Batman revisits the site of the World’s Fair. It can’t have been long, probably only a few years…five, no more than ten. Yet the World’s Fair is in complete ruin. The bright prospects of technology have faded and rotted. There is rust and grime all over the place. It’s not just a metaphor for Gotham City and the level of corruption that is rotting the city from within, but also a metaphor for Bruce Wayne. His optimism (and his hope) is gone. All that is left are the ruined relics of what he used to be. Like many episodes of the series that spawned it, Batman: Mask of the Phantasm comes to a bittersweet end. Gotham has been saved from the schemes of those who seek to exploit it once again, but for the men and women who live within it, there are no happy endings. If Batman has won, it’s been a hollow victory that has come with sacrifice and a reminder that his destiny is already laid out for him. The best victory Batman can achieve is to survive and fight another day. The fight against corruption will never end. There will never be relief. There is no way that I understood all of this twenty years ago when I sat in that empty theater with my snoozing family. I knew I liked what I was seeing and I knew that I appreciated that Batman was dark and didn’t smile and wink at the camera. He didn’t make jokes, and he took his work seriously. I appreciated that his criminals had layers and were truly dangerous. I also understood that they felt like real people. Now, twenty years later, I see the beauty of the story and I love it even more than as a kid. The film was a commercial failure because it was not easily packaged and marketed to general audiences. In many ways, it was the exact opposite of what is expected from a family movie based on a cartoon series. It took a lot of chances, and at the time seemed like it failed at most of them. But through the crystallizing lens of time, it’s clear that Batman: Mask of the Phantasm caught lightning in a bottle. It tells the most personal Batman story to ever grace a movie screen and understands what makes its characters tick more than any Batman movie before or after it. It’s timeless, and could just as easily have been released fifty years ago without any changes. I love it for what it is, but more importantly, I love it for what it isn’t. Great write up. 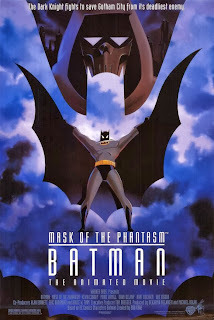 For all by Batman fandom Mask of the Phantasm is a movie ive only seen once quite a while. I didnt hit my geek stride until I was in my 20s so BTAS wasnt "my" Batman, as such. But reading your article has definitely made me want to revisit it. I dont know about you but for some reason I tend to take a while before the serious/more complex aspects of animated movies sinks in (in particular the DCU and BTAS movies). I think, for some reason, I still initially view them as cartoons. Or more accurately, I go in expecting a grand animated experience and feel underwhelmed when I see a cartoon and I end up just having a surface level experience..
Its a difficult thing to explain. Does anyone else experience this at all? Just me right? I've been disappointed by some of the recent animated features, but almost never by anything Bruce Timm is involved with. None of the other movies that came out of the animated series soared to the heights of Mask of the Phantasm, but I still enjoyed them. Dark Knight Returns, of course, being it's own beast, which was amazing. Ive actually found that the further a production goes from appearing like it is from the Timm-verse the more I am likely to become absorbed by it. Probably in part due to me not being a big BTAS/Timm disciple, so not a huge amount of affectionate nostalgia when it does look like Timm, and then in part due to it looking less like an actual cartoon so reducing this silly cartoon vs animation thing I got going on. And, yes. That goes for Conroy too. I just saw Batman: The Dark Knight Returns (I read the graphic novel in my 20s and loved it) and I kinda loved that. I never had a flat out "bias" against the animated shows, or so I thought...but Brad's comment made me realize that perhaps I did without ever really thinking about it. Reading what he wrote, I'd have to say that I relate very specifically to seeing them as "just" cartoons and almost certainly stayed away from them on that simple basis. Reading this piece, I'd say I've done myself a disservice by doing so; I'm intrigued to see this and will have to something about that. I gotta say, The Dark Knight Returns was the first DCUAOM (sigh) that I experienced as a cinematic movie first time around. Though I remember this movie coming out I really can't recall whether or not I actually watched it - your article makes me want to! Coincidentally I just watched Tim Burton's Batman Wednesday night and I can't say it has aged particularly well for me. I still appreciate certain moments (say what you want about Nicholson's Joker, the scene where he first sees his "new" face is awesome) and I still think Michael Keaton is a surprisingly great Batman, but most of the enjoyment I got out of it was nostalgic because I loved the hell out of it when I was younger. I was also a big fan of the animated series but for some reason it only played in the lunch-hour slot in my neck of the (literal) woods and I wasn't a kid that got to go home for lunch, so I mostly only saw it on holidays or sick days. I remember enjoying it well into my teens (when I was in to some decidedly adult things) so I'm not surprised that Batman: Mask of the Phantasm seems aimed at a more mature audience. I'll definitely keep an eye out for it! The episode the guys did on Burton's Batman movie really sums it up, but man, I still love that movie. I recognize that my love for it is purely nostalgic, but I do still love it. I watched that movie dozens and dozens of times when it came out on video, just like I did with Robin Hood: Prince of Thieves. Whether or not the movie was or is any good almost doesn't matter to me because of what it symbolizes. Looking back, Burton didn't understand Batman and barely showed Bruce Wayne's drive to fight crime. Yet still, that movie was a landmark. I loved the industrial look of Gotham City, I loved Batman's costume, and to this day, that's my favorite Batmobile, hands down. I even have a model of it from 1989 that I bought a few years ago. That movie meant the world to me. Talking about it now, I can tell that it still does. But go watch Mask of the Phantasm! It's even better, and it holds up to adult eyes. Thanks for the great write-up Heath. I am a huge fan of the Animated Batman series going back to when it originally aired. The overall look and style of the series was gorgeous, I really love the title cards they used for each episode. However, that said I have never seen Mask. Somehow I missed it, I will have to check it out. If you'd like to hear what they were thinking from Paul Dini himself, he and Kevin Smith did a commentary track for Mask of the Phantasm on Kevin Smith's Fat Man on Batman podcast, I believe it was episode 18.